Femtocell is a promising solution for enhancing the indoor coverage and capacity in wireless networks. However, for the small size of femtocell and potentially frequent power on/off, existing handover schemes may not be reliable enough for femtocell networks. Moreover, improper handover parameters settings may lead to handover failures and unnecessary handovers, which make it necessary to enhance the mobility robustness for femtocells. In this article, we propose a gradient method and cost function-based mobility robustness optimization scheme for long term evolution (LTE) femtocell self-organizing networks. Moreover, signalling overhead of the scheme is analyzed. Simulation results show that the proposed scheme has a better performance than the fixed parameters method in terms of reduced the number of handover failures and unnecessary handovers with limited signalling modifications. As macrocells have limited indoor coverage, while above 50% of the voice services and 70% of the data traffics happen indoors , offloading the traffics from macrocells is badly needed. Femto base station (FBS), which is also known as HeNB , is a low power wireless access point that can meet the need. A femto user equipment (FUE) can save its power consumption for the smaller distance between transmitter and receiver in femtocell systems. Femtocell is more harmony to the environment due to the lower carbon emission. Furthermore, femtocells use the cable and DSL as the backhaul to access the service provider’s network. As a result, it can improve the utility of the networks. Moreover, femtocell reduces the mobile operator’s OPEX because of the user’s self-deployment and self-configuration of FBS. However, the deployment of femtocell can also introduce technical challenges such as interference management and mobility management to long term evolution (LTE) and LTE-Advanced (LTE-A) networks. In traditional mobility management schemes, the handover parameters are set by the mobile operator, which is inefficiency and inaccurate. Recently, mobility robustness optimization (MRO) as one of the usecases in the self-organization networks has been studied to reduce radio link failures (RLFs) and unnecessary handovers due to improper handover parameter settings . However, traditional handover optimization is inappropriate for different characteristics in macrocell-femtocell hybrid deployment compared with those in macrocell due to the dynamic channel conditions and different mobility patterns. On one hand, the large number of femtocells makes it difficult to configure and maintains handover parameter optimization using existing schemes; on the other hand, since femtocell could be frequently turned on/off, channel conditions and neighboring cell list change frequently. To the best of authors’ knowledge, there are few studies focusing on mobility robustness optimization in femtocell networks. There are a lot of researches concerning the handover optimization in LTE macrocells. In , a cost function based handover parameter optimization scheme incorporating cell load, UE’s velocity and service type, is proposed for 3GPP LTE macrocells. In , admission control strategy and handover self-optimization are considered to optimize the handover performance. Joint hysteresis and time to trigger (TTT) optimization scheme is investigated in  to reduce handover failures. Most of these studies optimize the handover parameters, such as hysteresis and TTT, based on self-optimization techniques. MRO in macrocells has been extensively studied. In , hysteresis adapting based MRO scheme is proposed considering different UE velocities. The conflict between Mobility Load Balancing and MRO in handover parameters adjusting is solved in . Authors in  investigate the inter radio access technologies (inter-RAT) mobility robustness optimization between LTE and 3G/2G mobile systems. 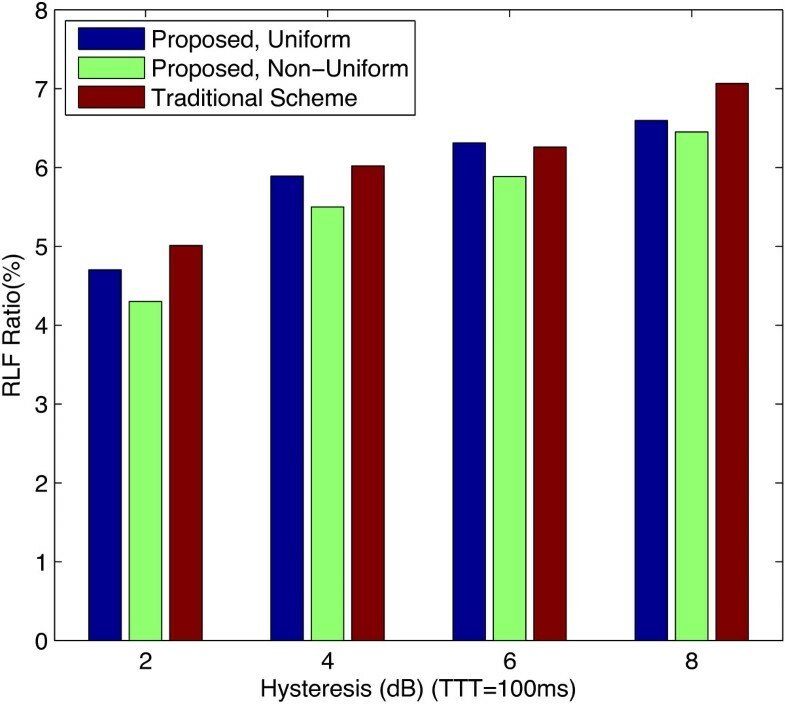 Different from the mobility robustness optimization in macrocells, the frequent switching on/off of them require robustness of the femtocell handover optimization, and traditional handover optimization may not be feasible for the femtocell deployments. And a lot of works have studied mobility management in femtocells, aiming to optimize neighbor cell list and reduce handover signalling cost for femtocells [9, 10]. In [11–13], interference and cell selection are managed using handover in femtocells. In , the authors propose a simple but effective method to access control and mobility management by rejecting the non-CSG user equipment (UE) coming close to the femtocell by using the CSG member list to reduce unnecessary handover in femtocell-macrocell coexisting scenarios. A novel handover decision algorithm using the combination of received signal strengths of the source cell and target cell is proposed to obtain a better system performance . Mobility enhanced scheme is introduced in  and signalling analysis for femtocell mobility is presented in . However, MRO in two-tier femtocell-macrocell networks receives little attention. In this article, we develop a handover parameter adjusting-based mobility robustness optimization scheme, which aims to reduce unnecessary handovers and RLFs caused by too late handover, too early handover, or wrong handover in open access femtocells. In order to realize the mobility robustness optimization, a cost function incorporating the unnecessary handovers and wrong handovers is introduced, and then a MRO scheme based on gradient algorithm [18, 19] is proposed for femtocell networks. 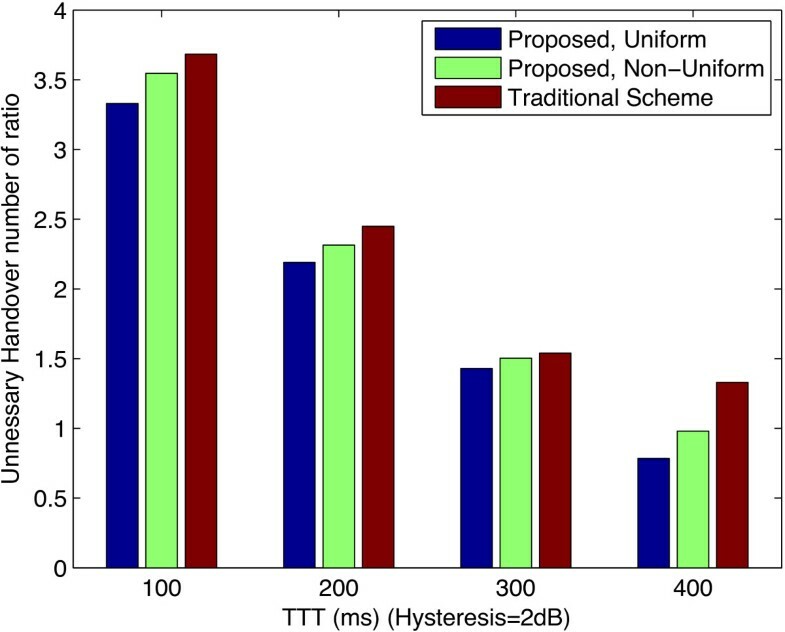 Finally, performance of the proposed algorithm is evaluated by extensive simulations. The rest of the article is organized as follows. Section 2 introduces the handover procedure, handover parameters and system model. In Section 3, gradient method based MRO is proposed with an analysis of signalling overhead and complexity. The simulation results are provided in Section 4. Finally, Section 5 concludes the article. 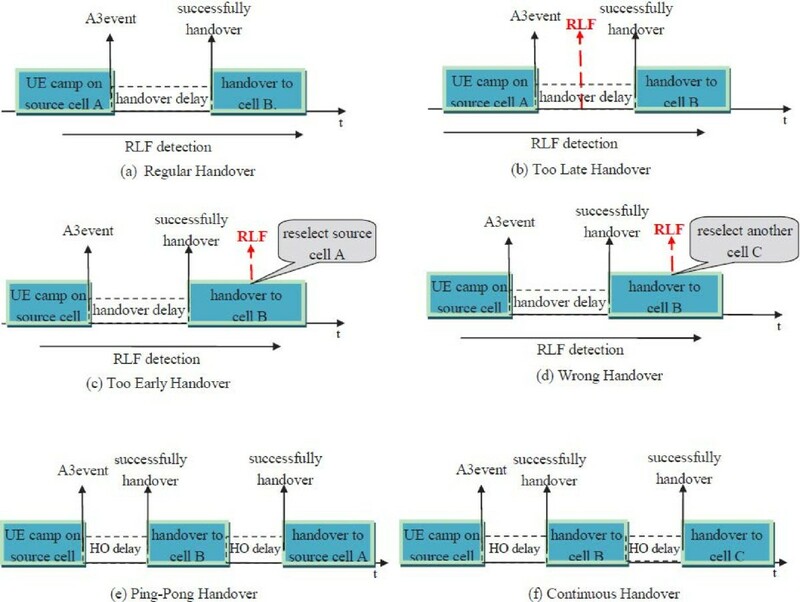 In this section, basic handover procedure and related parameters of femtocell handover are introduced, then RLF scenarios caused by too late handover, Too early handover, wrong handover, and unnecessary handover are described respectively. The standard femtocells coexisting with macrocells in LTE/LTE-A have been discussed in the Femto Forum, 3GPP and NGMN Alliance. Some mobility enhancing schemes have been considered in LTE/LTE-A femtocell networks . 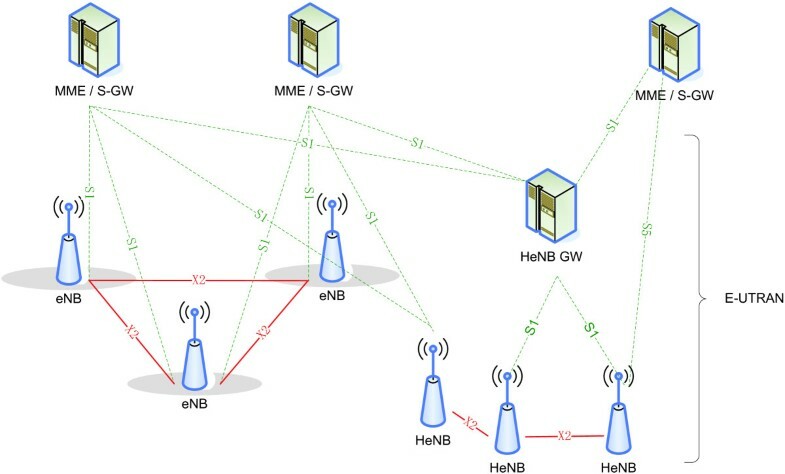 The reference LTE/LTE-A femtocell architecture is shown in Figure 1, which supports X2-based HO between HeNB and S5 procedures in case of local IP access (LIPA) . Overall E-UTRAN architecture with deployed HeNB GW. 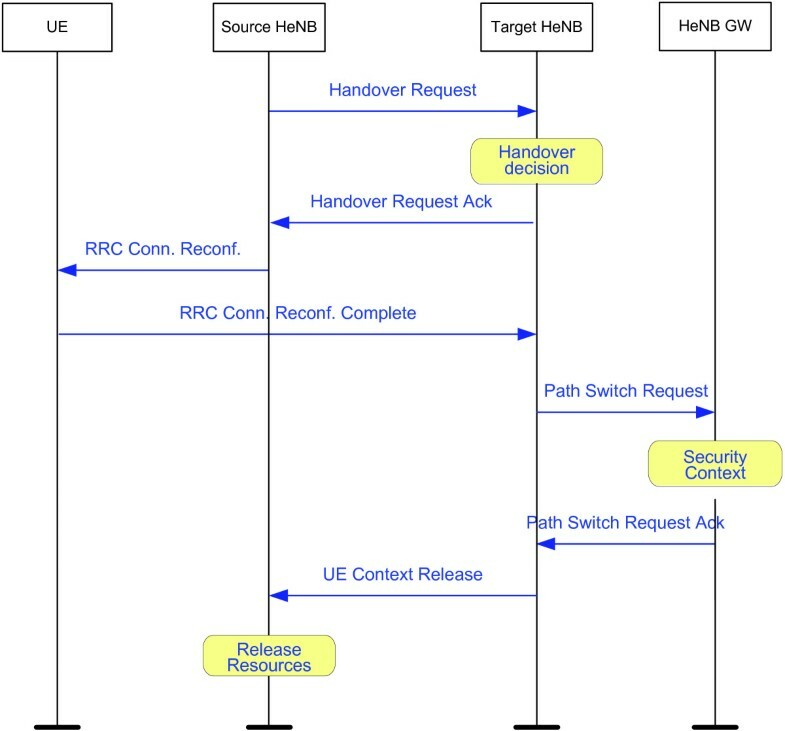 Since X2 interface is introduced in Figure 1, which is different from the early version of E-UTRAN network architecture , HeNB related handover procedure should be revised in both HeNB-HeNB handover and eNB-HeNB handover. Here we will present handover call flow based on the current E-UTRAN architecture  as illustrated in Figures 2 and 3. 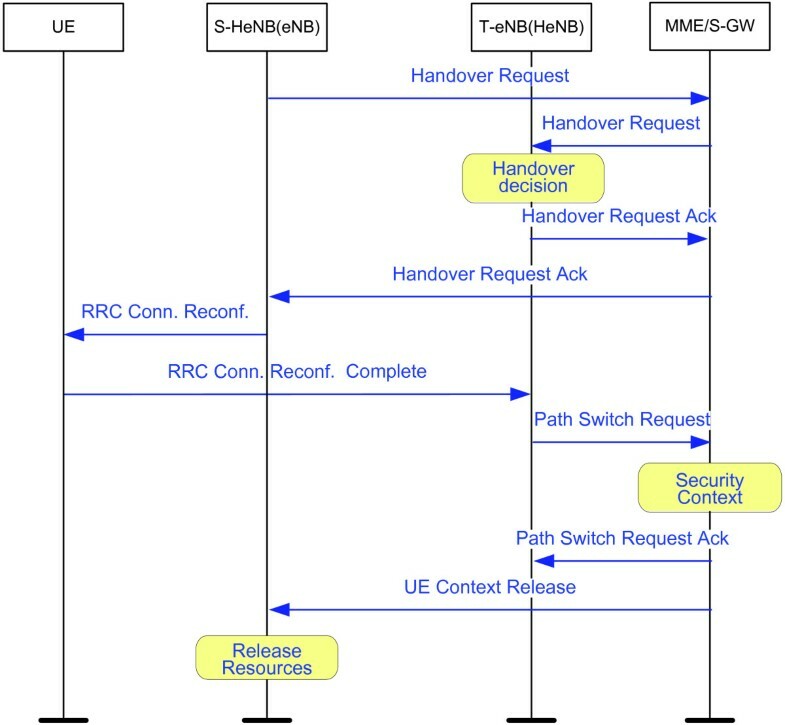 Figure 2 shows the handover procedures between HeNBs and Figure 3 presents the handover flow between eNB and HeNB . Handover procedure between HeNB and eNB. Handover in LTE/LTE-A femtocells is assumed as network-controlled hard handover with the assistance of UE [7, 22]. Handover procedure in LTE femtocells can be divided into four phases: handover measurement, measurement report, handover decision, handover execution. FUE periodically measures the reference signal received powers (RSRPs) of the serving cell and neighbor cells according to the measurement configuration and neighbor cell list sent by FBS. According to , if the entering condition of A3 event (neighbor cell is better than serving cell) in (1) is satisfied and lasts for a duration of TTT, then the A3 event will be triggered. After receiving the report from FUE, the serving cell will handover the FUE to the target cell. Otherwise, the FUE will leave A3 event if the leaving condition in (2) is satisfied. where RSRP s and RSRP t are the signal strengths of the serving cell and the target cell measured by UE, respectively, CIO s and the CIO t are the cell individual offset (CIO) of the serving cell and the target cell, respectively, Hys is the hysteresis value of A3 event, and Off is the offset parameter of A3 event. Given the value of Hys and Off, UE tends to handover to the cell whose CIO plus RSRP is higher. Too late handover: RLF occurs in serving cell before handover or during the handover procedure, then UE reconnect to the target cell (different from the serving cell). Too early handover: RLF occurs shortly after a successful handover to the target cell, and then UE reconnect to the serving cell. Wrong handover: RLF occurs shortly after a successful handover to the target cell, and then UE reconnect to another cell (neither the serving cell nor the target cell). Ping-pong handover: handover to the serving cell from the target cell shortly after a successful handover to the target cell. Continuous handover: handover to another cell (neither the serving cell nor the target cell) shortly after a successful handover to the target cell. The proposed procedure of RLF detection related to handover and unnecessary handover is shown in Algorithm 1. In Algorithm 1, Timer_UE_ID is the timer for UE, RLF_UE_ID is Cell ID of UE who undergos RLF, Last_Visited_Cell_ID is the Cell ID the UE lase visited, and Reconnected_Cell_ID is the Cell ID the UE reconnected after encountering RLF. The RLF event is detected and reported by UE once the RLF occurs, and then Timer_UE_ID, RLF_UE_ID, Last_Visited_Cell_ID, together with Reconnected_Cell_ID, are report to the FBS/MBS, and are finally collected by the SON module where the MRO algorithm is implemented. There are many handover parameters in femtocell MRO. Without loss of generality, we choose the CIO as the handover parameter to optimize in this article. where N1, N2, N3, N4, and N5 denote the numbers of ping-pong handover, continuous handover, too late handover, too early handover and wrong handover, respectively, and α i denotes the weight factor of N i . The value of N i is determined by Algorithm 1. In this section, we introduce the gradient algorithm [18, 19, 24] into femtocell MRO. Based on the above gradient algorithm, the pseudo code of the MRO algorithm is described in Algorithm 2.
where w0 is the initial value of w; C∗ is the minimum value of C; γ is the smallest decrease of C in each iteration; ε0 is a constant depending on w0; and ε is the convergence tolerance. For the detection of RLF and unnecessary handover in Algorithm 1, only three decision processes are needed to detect the handover event (e.g., lines 2, 5, 6 in Algorithm 1 to detect the too early handover). Moreover, the factors for detection in Algorithm 1, Timer_UE_ID, RLF_UE_ID, Last_Visited_Cell_ID, together with Reconnected_Cell_ID, are reported to the FBS/MBS, when a RLF event is detected. A similar signalling overhead is needed for unnecessary handover detection. Therefore, both Algorithms 1 and 2 can be implemented with little modifications of existing LTE/LTE-A handover protocol. The gradient based MRO algorithm proposed in this article is evaluated in a femtocell network by simulation. A macrocell and F femtocells coexisting scenario for the simulation is considered, and F is assumed to be 20. The random way-point model  is used as UE mobility model. A UE’s location is generated by a random destination and a random sample velocity with a sightline. Once reaching the destination, the UE stays for a random period of time. The macro UE (MUE) and FUE are assigned with different maximum velocity limits. The simulation parameters such as path loss, shadowing, and fading models, are given in Table 1. For the purpose of examining the impact of weight factors, two settings of weighting factors α i , which are named as uniform MRO and non-uniform MRO, respectively, are evaluated in the simulation. For uniform weighting, α i = 1, for i = 1, …, 5. For Non-Uniform weighting, α i = 1, for i = 1, 2, 3, and α i = 3, for i = 4, 5. To verify the effectiveness of the algorithms proposed, the Traditional Scheme, which uses fixed values of handover parameters, is compared with the proposed MRO algorithms. The RLF ratio is defined as the ratio of the number of RLFs caused by too late handover, too early handover, and wrong handover to the total handover attempts. Unnecessary handover ratio is defined as the proportion of ping-pong handover and continuous handover in the total handover attempts. Figures 5, 6, 7, and 8 show the comparison of the Traditional Scheme with the proposed gradient based MRO for different values of hysteresis and TTT. RLF ratio versus hysteresis (TTT = 100 ms). RLF ratio versus TTT (Hysteresis = 2 dB). Unnecessary handover ratio versus hysteresis (TTT = 100 ms). 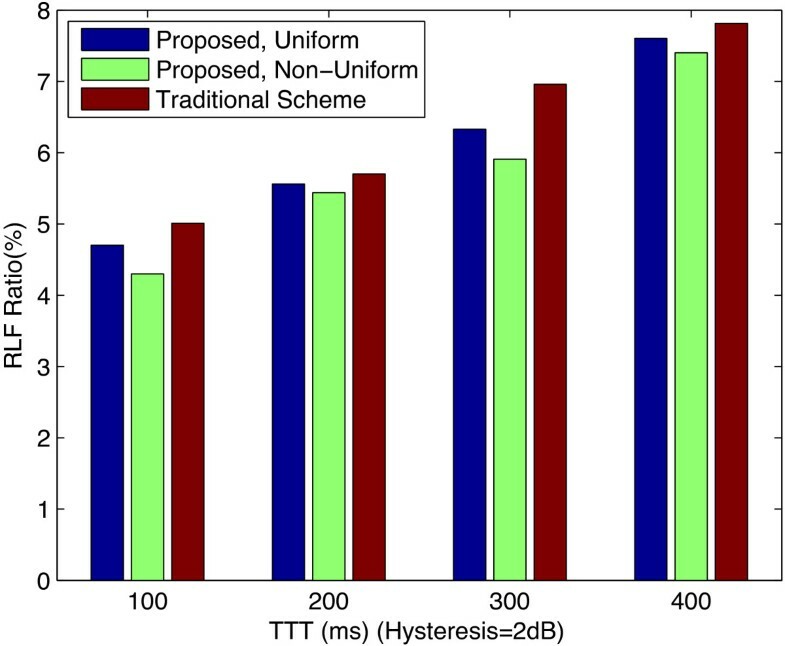 Unnecessary handover ratio versus TTT (Hysteresis = 2 dB). As can be seen from Figure 5, the RLF rate increases as the hysteresis increases. This is because when the threshold of the handover parameter (hysteresis) increases, FUEs tend to stay in the camping femtocell, instead of handover to other femtocells, which may have better signals. Therefore, a bigger hysteresis results in less handover attempts, but the too late handovers may still happens with Algorithm 1, resulting in increased RLF ratio. The number of too early handovers increases as the hysteresis/TTT increases, but the trend of RLF ratio does not change for the small number of too early handover in total RLFs. It can be seen from Figure 5 that the gradient based mobility robustness optimization has a better performance than traditional scheme in terms of RLF ratio. Since Non-Uniform MRO has a heavy weighting in Too Late Handovers, the proposed non-uniform scheme results in a lower RLF ratio. In Figure 6, as the value of TTT increases, the RLF rate increases. This is because when the value of TTT increases, FUEs tend not to handover to other femtocells due to the extended observation window time. Therefore, more Too Late Handovers happen in Algorithm 1, which results in higher RLF ratio. The proposed schemes outperform the traditional scheme, and non-uniform MRO has a better performance than the Uniform one. Figure 7 illustrates the unnecessary handover ratio of all schemes considered. As can be seen in Figure 7, unnecessary handover ratio decreases as hysteresis increases, because when the threshold of handover decision decreases, Too early handovers, ping-pong handovers, and continuous handovers are more likely to happen in Algorithm 1. Similar observations can be made in Figure 8, where unnecessary handovers occur because the observation window time is longer due to the shorter TTT. In both Figures 7 and 8, Uniform weighting factors has better performance than Non-Uniform ones, because unnecessary handover has a lower weighting factor in Non-Uniform schemes. The proposed algorithm obtains a good tradeoff between unnecessary handovers and unsuccessful handovers through adjusting weighting factors. Since RLF is more intolerant for uses compared with unnecessary handover, the non-uniform weighting scheme more preferred. In this article, a gradient based MRO scheme together with a detection algorithm of RLF and Unnecessary Handover is proposed in self-organizing LTE/LTE-A femtocell networks. After the successful detection using Algorithms 1 and 2 uses a gradient method to reduce the RLF and Unnecessary Handovers based on a cost function calculated by Algorithm 1. Simulation results have shown that the proposed scheme can achieve a reduction of RLF ratio and unnecessary handover Ratio with little handover signalling modifications. This study was supported by the National Natural Science Foundation of China (61101109), the Youth Research and Innovation Project of Beijing University of Posts and Telecommunications, the Co-building Project of Beijing Municipal Education Commission, and the National S&T Major Project of China (Nos. 2010ZX03003-001-01 and 2011ZX03003-002-01).